Bikes are considered to be the best mode of transport in the country. They are lithe enough to slide through narrow by-lanes of cities and also fuel efficient enough. For a family of two, a bike is enough. Not only does it help to commute long distances but also shorter ones. Most families and couples start out with owning a bike and then graduate to a car. The popular bike makers in India are Honda, Hero Moto Corp, Bajaj and TVS. Foreign makers such as Yamaha, Suzuki and KTM are also quite popular among the masses. Yamaha has been a trusted brand among Indians for their pick up and high performance. The bike maker is not new to the Indian market and has been serving it for the past three decades or so. One of the most sought after models from the house of Yamaha was the single cylinder, two stroke motor bike Yamaha RX 100 which is twin stroke. It was produced between the years 1985 and 1995 in India and Japan. The bike was launched in the latter half of 1984. The units which were made between the years 1985 and 1987 were CKDs or had knock down kits and they were only assembled in the country. The major change which was performed on the bike was the upgrade of the 6 volt electrical system to one which was a 12 volt system. The production period of the bike was between November 1985 and March of 1996. Different modes such as disc brakes, expansion chambers and a 5th gear were included in the bike. After the production of the bike was halted, a new RXG model was launched with 132cc displacement engine and one which produced 11.8bhp power. The bike however has a faulty ignition system that was replaced by the firm at zero cost. The next model which was launched in the market was the RX 135 which was essentially a remodelled RXG. The RXZ has been launched with a headlamp fairing which looks sporty. In the period between 2000 and 2001, the company launched the RX135 which had a peak power of 14bhp and the RXZ which were both fitted with a catalytic converter silencer. These bikes were only moderately popular among the masses. The RX 135 which had a 4 speed gear box with catalytic converter silencer sported a fuel gauge and speedometer which had white dials. The final variant of the RX 135 has a 4 speed engine with catalytic converter silencer, which sports a speedometer and fuel gauge with white dials which was sold quite briefly till 2003. The bike managed to produce peak power of 11HP available at 7500rpm and torque of 10.39Nm available at 6500rpm. The suspension of the bike was a double cradle frame. The bike managed to reach a top speed of 100kmph and was quite fuel efficient, offering 35 to 45kmpl. The wheelbase of the bike was 1000mm while the seat was 29.5 inches. This was the lowest seat height for the models which were adjustable. Both the brakes of the bike were drum ones. The bike was quite popular for its sleek frame and smooth performance. For a mid range bike, it was quite popular. 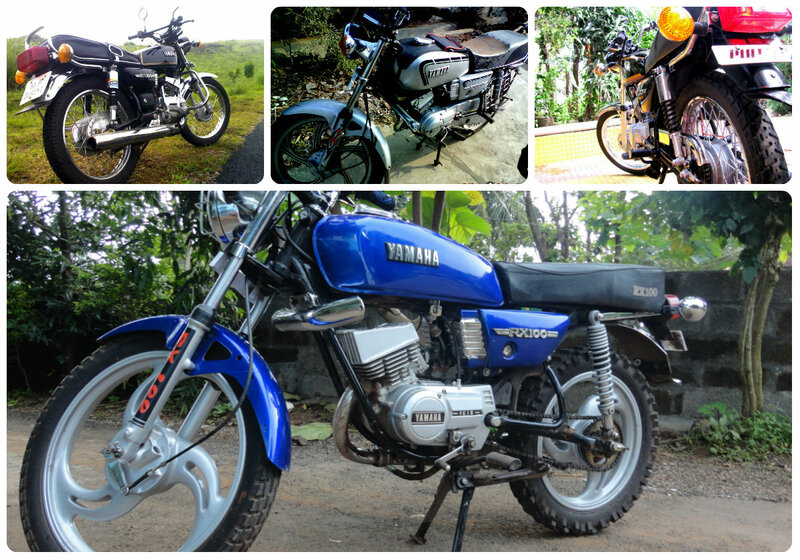 The RX100 bikes from Yamaha that are available nowadays are mostly 12 years or so old. Despite the bike being such an old one, people want to buy it for its smooth performance, slight frame and good enough fuel efficiency. The older ad campaigns launched for the bike read “Ahead of the 100s” and “Born to lead” which were quite apt for the bike launched in the 1980s. The bike was available in blue, red, black and silver shades. The Yamaha RX100 price in the market is around Rs 20,000 or so. For older models, the price may be lower. To buy the bike, you would have to comb the second hand market because it is no more in production. Nevertheless, locating a model would not be difficult as the bike was quite popular. The best place to scan for the bike would be the online second hand market, which has different kinds of bikes on offer. You can visit car selling sites or online classifieds which offer second hand bikes for sale. Simply select the city you are in and the website would show you the results. You can read up the specs of the bikes on offer such as the number of kilometres covered, the year of manufacture, colour and other details. The price of the bike may be mentioned too for your benefit. Contact information of the seller is also available on the website and you can get in touch directly. Before you buy the bike, you should check the papers of the bike- the insurance papers, the tax papers, pollution clearance certificate and registration papers. Pay special attention to checking the pollution clearance certificate because a very old bike may not clear pollution norms in the country. You should also ride the bike for a good stretch to see whether it performs well. Make sure you choose a road which has moderate traffic so that you understand how to handle the bike. The Yamaha RX100 price is quite reasonable for the performance offered. You can also buy the Hero Honda CD100 or similar bike if you are not too comfortable with the proposition of riding the bike. However, for a beginner, this bike is one of the best because the handling is smooth and unsophisticated. The speed achievable is also not very high which reduces the possibility of accidents caused due to speed. Even for regular use, it is a good bike. Commuting within a city would be quite easy and a couple can ride quite comfortably on the bike. The pillion seat is stretched out unlike the new bikes launched in the country. A guard has been put up on the back for holding onto by pillion passengers. It is indeed a great buy and the Yamaha RX100 price is quite affordable for most people.